A rather depressing milestone was announced this week. The number of oil well drilling rigs in the United States has reached its lowest count since records began to be kept in the 1940s. Drilling rig counts have been by Baker Hughes, Inc. for many decades and are announced weekly. 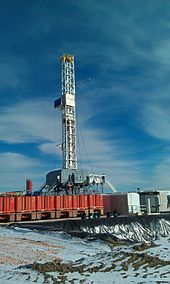 The count for the week ending March 11, 2016 was 480 drilling rigs. One commentator stated that there was not a consistent series of rig counts before 1948, but thought that to find a lower count, we would have to go back to the 1860s. The declining rig count is just one more effect of the fall in oil prices from $100 per barrel and more during the summer of 2014 to current levels of nearly $30 per barrel. The numbers hide the human cost behind the numbers. Each drilling rig has its own crew of very specialized workers. In many cases, the crews have worked together for many years. Watching an experienced crew operate a drilling rig is like watching a very special kind of ballet. I’ve seen some drilling crews in which very little verbal communication is exchanged. Instead, each member of the crew seems to know just when to do their part without instruction from the crew chief. Each of these laid-off crew members often represents a family who are now tightening their belt. While we enjoy lower gas prices when we fill up our car’s tank, we would do well to remember the human impact of lower prices.